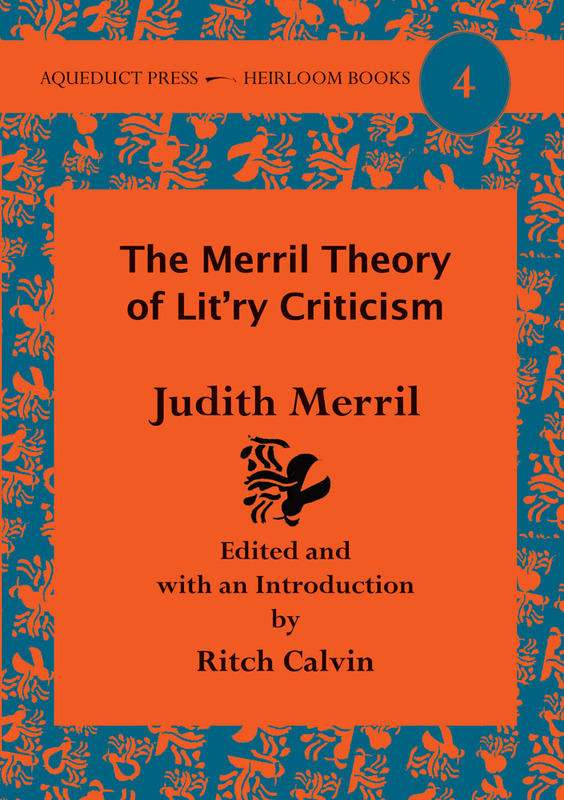 I'm pleased to announce the release of the fourth volume in Aqueduct's Heirloom Books series, The Merril Theory of Lit'ry Criticism, which collects Judith Merril's nonfiction, edited by sf scholar Ritch Calvin. Aqueduct is offering both print and e-book editions. Although Judith Merril is best known for her short fiction and her novels (in collaboration with C. M. Kornbluth), she wrote a great deal of nonfiction. She wrote about SF fandom. She wrote about space and space exploration. And she wrote about science fiction. This volume collects Merril’s nonfiction from The Magazine of Fantasy and Science Fiction, Extrapolation, and her Year’s Best anthologies. In these collected pieces, Merril works through and develops her definition of “S-F” and what makes S-F good. She chronicles changes within the genre, including the emergence of the New Wave. And she provides a history of the genre: its writers, its publishers, and its magazines. Now, in 2016, Aqueduct brings Judith Merril and her place in that history to today’s readers. Gary K. Wolfe writes of the book in the February 2016 issue of Locus: The Merril Theory of Lit’ry Criticism provides our first chance to see in one place Merril’s columns for the magazine [i.e., The Magazine of Fantasy and Science Fiction] between 1965 and 1969, plus appreciations of Theodore Sturgeon and Fritz Leiber, introductions to her groundbreaking ‘‘year’s best’’ anthologies of the ’50s and ’60s, and a more or less theoretical/historical piece from the academic journal Extrapolation. In an unusual strategy, Aqueduct has made available in the e-book full versions of some pieces that are only summarized in the print edition. ...Merril was ... a pioneer in assaulting literary moats and walls, as her anthologies insistently made clear, and it’s fascinating to find someone articulating a half-century ago some approaches to fiction that are only now beginning to look like common sense. You can purchase either the print or the e-book editions at http://www.aqueductpress.com/books/978-1-61976-093-6.php.